Today is indeed an auspicious day – 27th August is the UK’s first National Burger Day. Organised by daily men’s lifestyle email Mr Hyde, over 160 restaurants across the UK are offering 20% off their burgers for today only. In celebration we have brought you a collection of amazing burgers – some big, some small, some expensive, some downright crazy – but all in the spirit of Burger Day! A Minnesota casino cooked up a 2,014-pound, 10-foot-diameter bacon cheeseburger that contained 60 pounds of bacon, 50 pounds of lettuce, 50 pounds of sliced onions, 40 pounds of pickles, and 40 pounds of cheese. 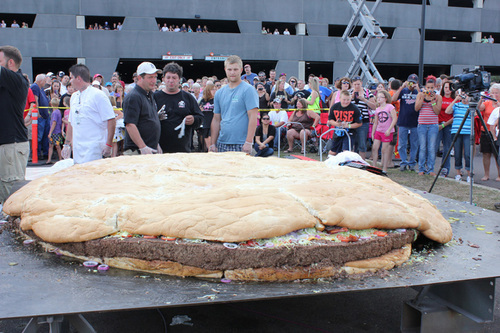 Naturally, it cinched the Guinness World Record for biggest burger. The burger was cooked using an outdoor oven powered by propane torches and 15-foot steel skillets. It took about four hours at 350 degrees to cook the burger, and more than seven hours to bake the bun. Design Restaurants Managing Director, Tessa Shreeve, now outed as a veggy (read here) is very vocal when trying to convince restaurants to cater more for vegetarians. She says “Even veggies love to eat burgers and the best I’ve ever had is at The Muddy Duck in Hethe just north of Bicester. It’s easily the most delicious veggy burger I’ve ever tasted”. We would not dare argue. As Tessa’s burger never stays around long enough for a picture we have had to get creative with the image. The chef tasked with cooking the worlds first lab grown burger was Richard McGeown of Couch’s Great House Restaurant in Polperro, Cornwall, who said it was slightly more pale than the beefburgers he was accustomed to but that it cooked like any other burger, was suitably aromatic and looked inviting. 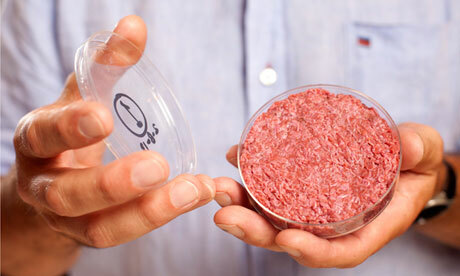 The 5-oz beef patty assembled from thousands of teeny-tiny meat strips, cultured from the stem cells of a single cow was reputed to have taken 3 months to make and cost £250,000. Yum. 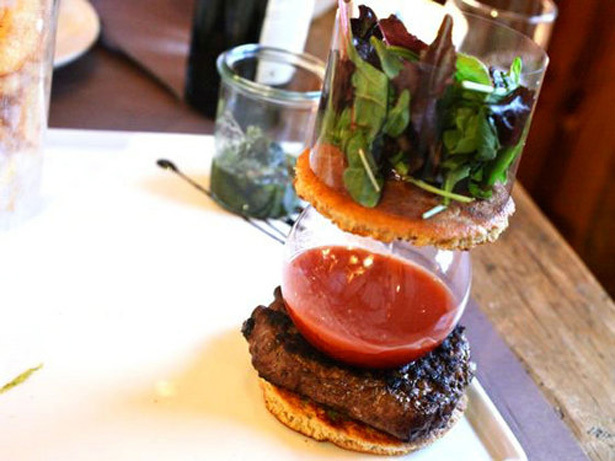 At the Chalet Regain in France, Les Hambur “goûts” takes everything you love about a burger and then makes it really really complicated. So you take off the cylinder of greens and then you have a spherical jug of thin tomato sauce inside the bun which you pour into the burger, along with another topping of choice in a separate cup. By which time you’ll have worked off the calories you’re about to ingest. Almost. Determined to outdo Le Burger Extravagant, the $295 creation from Serendipity 3, The 666 Burger Food Truck decided to out-do them by creating The Douche Burger, which costs $666. 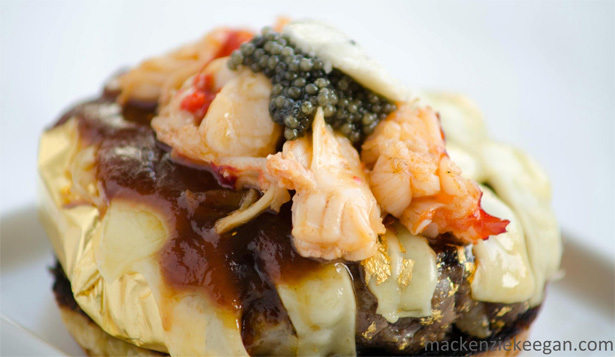 It contained a Kobe patty, stuffed with foie gras and wrapped in gold leaf with caviar, lobster and truffles piled on top. It also contained Gruyere melted with Champagne steam and a BBQ sauce made using Kopi Luwak coffee, one of the world’s most expensive coffees. Even though it was ultimately a joke, one person actually bought it. True fact. Heston’s quest to create the perfect burger involves making your own buns, custom cream cheese slices and grinding your meat in a very particular way. With 32 ingredients and a preparation time of 30 hours it is not a feat to be undertaken by any less than the most dedicated gourmet burger chef. 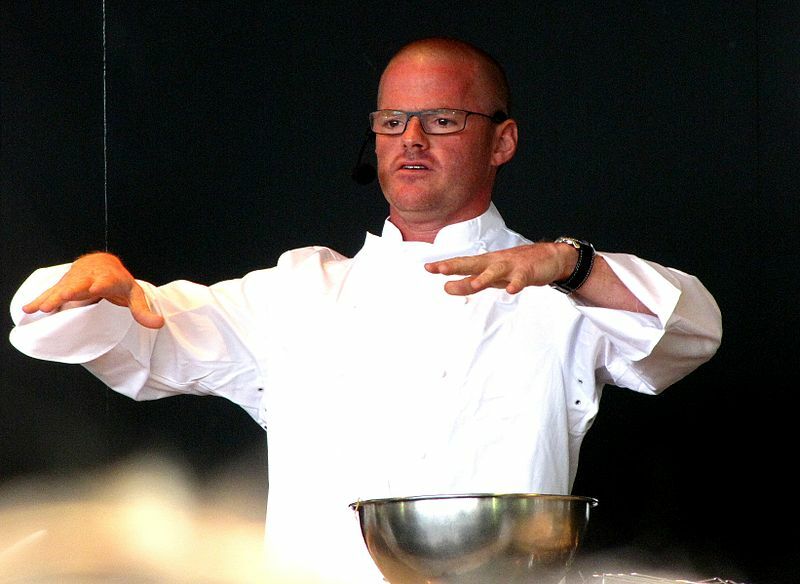 Reports have it that the burger tastes great but Heston’s claim that ketchup is not needed is false. Next articleAwardsWhich City is the Haute Cuisine Capital of the World?